This article appeared in the last print edition of The Remnant. To see what else was in that issue, subscribe today! Long in the making under the Vatican Secretary of State’s policy of Ostpolitik—the Vatican’s diplomatic accommodation of communist regimes, which begin with Vatican II’s shameful silence on the evils of Communism—the Vatican-engineered destruction of the visible Catholic Church in China appears to be entering its final stage. Bergoglio, who has never uttered a critical word against communist or socialist dictator but freely declares that Trump is “not a Christian” if he builds a border wall, seems determined to finish the job already begun during the reign of John Paul II under the administration of Cardinal Angelo Sodano. Sodano is the same corrupt bureaucrat who was covering up the Father Maciel scandal at the same time he was trotted out as the Oracle of Fatima concerning a ludicrous “interpretation” of the Third Secret we are supposed to believe Our Lady imparted to the Church as a riddle to be solved by him. The coup de grâce about to be administered is an enforced merger of the “underground” Catholic Church in China, meaning the true Church, with the Chinese Patriotic Catholic Association (CPA), the government-controlled pseudo-Church created by the Red Chinese regime in 1957 as an instrument for the suppression and ultimate destruction of the Faith in China. This was to be accomplished via the illicit consecration of schismatic bishops and their consecration in turn of schismatic priests. The process began with the ecclesiastical treason of legitimate Catholic bishops then in communion with Rome. In 1954, in his encyclical Ad Sinarum Gentem (1954), Pope Pius XII reprobated members of the Church in China who were promoting the error of the “Three Autonomies,” according to which the Church in China “would be completely independent, not only, as We have said, in regard to its government and finances, but also in regard to the teaching of Christian doctrine and sacred preaching…” In fact, the “autonomy” of both doctrine and preaching is precisely the purpose of the CPA, which ensures the conformity of its members, at least by their coerced silence, to the immoral policies of Beijing and the general independence from Roman authority in cases of conflict with the regime. For by particularly subtle activity an association has been created among you to which has been attached the title of “patriotic,” and Catholics are being forced by every means to take part in it. This association—as has often been proclaimed—was formed ostensibly to join the clergy and the faithful in love of their religion and their country, … And yet—despite these sweeping generalizations about defense of peace and the fatherland, which can certainly deceive the unsuspecting—it is perfectly clear that this association is simply an attempt to execute certain well defined and ruinous policies. For under an appearance of patriotism, which in reality is just a fraud, this association aims primarily at making Catholics gradually embrace the tenets of atheistic materialism, by which God Himself is denied and religious principles are rejected. [I]t follows that no authority whatsoever, save that which is proper to the Supreme Pastor, can render void the canonical appointment granted to any [legitimate] bishop; that no person or group, whether of priests or of laymen, can claim the right of nominating bishops; that no one can lawfully confer episcopal consecration unless he has received the mandate of the Apostolic See. Consequently, if consecration of this kind is being done contrary to all right and law, and by this crime the unity of the Church is being seriously attacked, an excommunication reserved specialissimo modo to the Apostolic See has been established which is automatically incurred by the consecrator and by anyone who has received consecration irresponsibly conferred. Sixty years later, under the influence of Ostpolitik, practically all of the CPA schismatic bishops still alive or subsequently installed by Beijing, now some 53 in number, have purportedly been “recognized” by Rome despite their subordination to communist gangsters. Seven more have requested to be “reconciled” with Rome while retaining their membership in the CPA and thus their subjection to the same immoral regime. Every one of them has usurped ecclesiastical jurisdiction—in which usurpation the Vatican itself now apparently concurs. Meanwhile, the surviving “underground” bishops, who have refused to join the CPA schism, are now only 17 in number (excluding retired bishops). They are prevented from consecrating successors by the same Church law cited to justify the “excommunication” of the four bishops of the Society of Saint Pius X: Canon 1382, whose penalty of latae sententiae excommunication has apparently been lifted as to the CPA puppet bishops whose strings are held by communist dictators. Worse, pursuant to a deal reportedly already agreed to by Bergoglio’s Vatican and Beijing, the Vatican has “requested” (read: demanded) that two of the remaining 17 “underground bishops,” Vincent Guo Xijin and Peter Zhuang Jianjian, “surrender their titles to their illegitimate competitors,” while all seven of the schismatic CPA prelates still seeking Rome’s approval would receive it. Still worse, under the same deal China’s so-called Council of Bishops would choose the names for future bishops to be approved by Rome, all of whom would belong to the CPA. The “Council of Bishops,” writes Sandro Magister, is “an imitation episcopal conference under the strict control of the regime, from which are excluded all bishops who are recognized by Rome but not by the Chinese authorities.” The head of this faux bishops’ conference is CPA bishop Ma Yinglin, one the seven schismatic pretenders to the Catholic episcopacy Rome yet to recognize, while the vice presidents include two other yet-to-be “approved” schismatics: Guo Jincai of Chengde, the “secretary general,” and Zhan Silu di Xiapu-Mindong. The remaining council members are all CPA puppets who have already received Vatican recognition: Fang Xingyao of Linyi, Shen Bin of Haimen, Fang Jianping of Tangshan, Pei Junmin of Liaoning, Li Shan of Beijing, Yang Xiaoting of Yulin, He Zeqing of Wanzhou, Yang Yongqiang of Zhoucun. Thus, under the deal whose execution appears to be imminent, there would be a total ascendancy of the CPA pseudo-Church over the true Church in China and a total betrayal of the faithful Catholic clergy and laity who, for more than half a century, have suffered persecution, imprisonment and even death rather than submit to the control of a communist regime that imposes forced abortion on its subjects. I would like to say with great simplicity and clarity that the Church will never forget the past and present trials and sufferings of Chinese Catholics. All this is a great treasure for the universal Church. Therefore, to the Chinese Catholics I say with great fraternity: we are close to you, not only through prayer, but also through our daily commitment to accompany and support you on the path of full communion. We ask you, therefore, that no one should cling to the spirit of opposition to condemn his brother or use the past as an excuse to stir up new resentments and closures. In other words, thanks for all that suffering! Kudos to you! But now we are about to render your suffering utterly vain. Please lie down and surrender as we sell you out to the communists in Beijing. At the very moment this betrayal is about to be accomplished, Beijing has begun “strictly enforcing regulations which up to now were practically only on paper” so that “from the 1st of February 2018 attendance to Mass in the underground will no longer be tolerated.” So, Catholics will henceforth be permitted to attend Mass only in the churches operated by the CPA, to which the Vatican is now in the process of surrendering control over the faithful in China. That control will include government surveillance cameras in key churches. 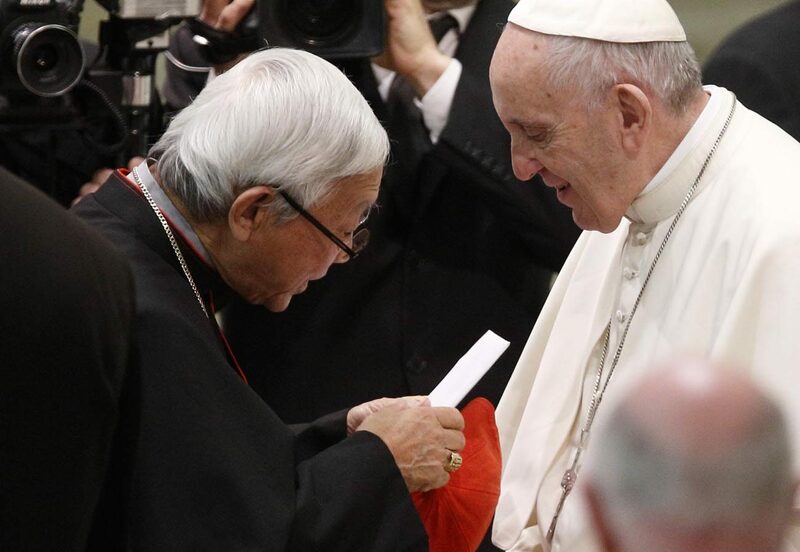 Cardinal Zen even managed to obtain an audience with Bergoglio, during which he said: “Yes, I told them [his collaborators in the Holy See] not to create another Mindszenty case”! By which he meant the case of Cardinal Josef Mindszenty, the Archbishop of Budapest and Cardinal Primate of Hungary under the Communists, who was sentenced to life in prison and subjected to torture until his liberation during the Hungarian Revolution of 1956. Paul VI, following the new policy of Ostpolitik, infamously sacked Mindszenty and ordered him to leave Hungary in order to make room for a successor agreeable to the Communists after the revolution failed. Unfortunately, Bergoglio’s representation to Cardinal Zen is probably no more reliable than his promise to a grieving mother, “six of whose nine children are members of the Franciscan Friars (two of the children) and Sisters (four of the children) of the Immaculate.” Bergoglio assured the woman that “soon, soon” his persecution of the order would end, after which both wings of the order were essentially destroyed by Bergoglian commissions. The impending sellout of the faithful Catholics of China, which fulfills the worst fears of Pius XII, is but the latest stage in a pontificate that represents a continuous infliction of grave harm upon the Church and an unremitting “danger to the faith.” Beyond praying for Bergoglio’s conversion or the Church’s deliverance from his clutches, the rank-and-file faithful, as members of the Church militant and confirmed soldiers of Christ, have a duty to raise up an unceasing worldwide protest against his absurd pronouncements and unconscionable abuses of the Petrine office. Catch Chris' regular column in The Remnant Newspaper!